The old saying “you get what you pay for” still holds true today––particularly when it comes to manufacturing. For those looking to get the best value for their money in a manufactured product, you should look no further than your own backyard. While the allure of cheaper products may be drawing many companies to look abroad for manufacturing partners, there is tremendous advantage in using a domestic-based manufacturer instead––especially when it comes to quality. There’s a reason American manufacturing has been known for its high quality for more than a century. In the United States, there are many standards and regulations in place to ensure that manufacturers are selling their customers the highest-quality products. American manufacturers are also known for using advanced technologies in high-grade facilities to produce consistent products supported by exceptional customer service. When working with a manufacturer in the United States, you can rest assured knowing that the workers making your product are working in a safe environment with the proper amount of labor protection. Unlike many other nations, the United States enforces strict labor laws and safety requirements to protect workers operating in potentially hazardous work environments. The United States also has more intellectual property laws in place than many other nations, helping to safeguard your ideas and trade secrets against competing companies. One of the greatest benefits, however, is the proximity that you’ll have to the manufacturing process. Because your product won’t need to be shipped halfway around the world, you can be sure that it will get to you much sooner­––and at much less cost. With less travel time required, there is also less chance that your product could be damaged during transit or become lost or displaced. Should an issue arise, the closeness of a U.S. manufacturer means they’ll be able to inform you of the problem much sooner and rectify it before it causes significant delays. If the manufacturer is close enough, you may even be able to visit their facility to see their operations for yourself and weigh in on the finished product before it ships. Maybe most importantly, working with American manufacturers helps support local companies and provide jobs––providing an overall boost to our domestic economy. At American Industrial Company (AIC), we pride ourselves on being an entirely American-based manufacturer. Our facility is located in the heart of the Midwest in Gurnee, Illinois. It is here that our talented team designs and manufactures all of our parts, ensuring that each product meets the highest of industry standards. Within our facility, we demonstrate an ongoing commitment to providing a safe and comfortable work environment for our team with our current ISO 9001:2015 certification. We are experienced in providing a number of manufacturing services for our customers with a commitment to satisfaction and quality. We work closely with our clients throughout the entire manufacturing process––from initial design to final product––to ensure that everything we produce not only meets customers’ desired requirements, but exceeds them. Our in-house capabilities include metal stamping, laser cutting, prototyping, design and engineering, tooling services, and other value-added services. If you’re looking for an American-based manufacturer who offers a large selection of customization options, a full range of in-house capabilities, and a demonstrated commitment to quality and reliability, consider working with AIC. To learn more about what our team of American manufacturing experts can do for you, download our eBook today! Metal stamping is set to have a great year in 2018—even beyond the already impressive year the sector experienced in 2017. This growth in precision metal stamping may largely be attributed to growth in the U.S. economy, which is set to experience an additional 2% GDP growth this year. Across the United States, new markets are opening up, providing a wide range of opportunities for various manufacturers, including the metal stamping industry. The metal stamping industry has seen significant growth in the aerospace, defense, and automotive verticals, which have all contributed directly to the substantial growth metal stamping experienced in 2017 and 2018. The aerospace sector is making technological advancements at a record pace, leading to rapid growth––particularly when it comes to the defense and commercial aviation sectors. This expansion has resulted in greater demand for sheet metal fabrication worldwide, as metal stamped components make up a significant portion of defense and aviation equipment and vehicles. This demand has been most noticeable among the commercial and military aircraft market divisions. The automotive industry is also projecting significant growth in metal stamping demand. Metal stamping plays a critical role in automotive applications, as metal stamped components are widely used in everything from vehicle bodies to engines and fuel systems. The flexibility of metal stamping makes it an ideal process for automotive manufacturers, allowing for a wide variety of custom shapes and sizes that meet the various specifications of each model’s unique design. In the midst of a strong economy, the demand among consumers for new vehicles has also grown. Increased production of passenger vehicles has steadily driven growth in the automotive metal stamping market. The Asia Pacific region is experiencing the largest revenue growth in the automotive metal stamping market. Europe and North America follow, and growth in coming years is expected in Latin America, the Middle East, and Africa as well. Metal stamping is known for its versatility, due to the wide range of processes that stamping equipment is able to perform. This versatility enables stamped metal components to be used in almost any application and setting. Of the numerous stamping processes available, there are a few that are expected to stand out in 2018. Manufacturers are increasingly incorporating automated processes and robotics into their metal stamping operations as a way to enhance productivity and further increase the precision of metal stamped parts and components. 3D printers have been a common tool for prototyping for several years. Many 3D printing providers already offer metal-printed parts, but the process is currently not cost-effective for large production runs. Recent advancements in this technology suggest that 3D printed metal components and parts will become far more cost competitive across metal fabrication sectors. Rising costs for outsourced overseas manufacturing operations have made moving back to the United States more appealing than in years past, and metal stampers are taking notice. American manufacturers are taking advantage of new technologies and automated processes to build efficient and affordable operations on their home soil. American Industrial is a leading U.S.-based metal stamper, specializing in precision metal stamping and assemblies. For almost 30 years, our company has been ahead of the pack, using state-of-the-art technologies to provide our clients with customized solutions that can deliver precision metal stamped components and parts for any application. With our ongoing dedication to quality, we are committed to creating only the best products for our customers. 2018 is shaping up to be a big year for metal stamping. 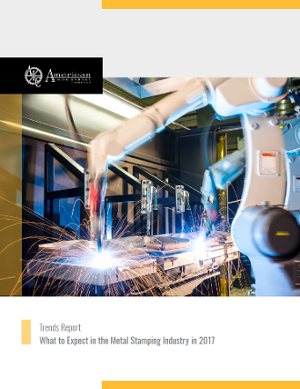 To learn more about this year’s trends, download American Industrial’s newest eBook­, Made in America: Metal Stamping 2018 Trend Report. Stamped metal components form the building blocks of vehicles, equipment, electronics, appliances, tools, and so much more. Precision metal stamping processes employ a wide range of specialty equipment to cut, pierce, bend, and form sheet metal to meet modern needs. Steel and steel alloys, brass, aluminum, and copper are all popular materials for stamping projects, and all often begin as simple sheets. Through metal stamping technology, these essential materials are transformed into either stand-alone, high-performance components, or pieces of larger, more complex assemblies. Precision metal stamping serves a wide variety of applications and industries. Within the electrical and power industry alone, stamped metal parts serve countless needs across a wide variety of electrical components. The absolute accuracy of reliable metal stamping proves critical to everything from the intricate components in automotive set-ups to large metal industrial housings. Clips, cups, covers, fasteners, and even sensitive electronic assemblies join the list of precision products made from detailed stamped metal parts. Construction environments require durability. Harsh conditions, aggressive use, and high wear are all par for the course. Custom metal stamping combines accurate, repeatable manufacturing processes with these rigorous needs. Stamped parts are long-lasting, resist temperature strains, maintain integrity under the threat of rust or corrosion, and offer high strength alloy material choices for heavy lifting. Metal stamping serves the needs of power tools, panel fastening systems, industrial switches and connectors, and even complex custom assemblies for construction projects. From doors, shelves, and cabinets to lighting fixtures and custom switches, stamped metal parts serve hardware needs both commercial and residential. Nuts, bolts, screws, hinges, and washers don’t even begin to cover the comprehensive list. Catches, latches, locks, and closer systems. Doors, handles, and cabinetry essentials. Custom quick connects and lighting components. The precision and durability of stamped metal components make for exceptional fastening solutions. Hooks, bolts, and even complex contact elements can all be stamped. The range of capabilities and finishes available for stamped parts make for readily customized brackets, latch assemblies, and lock systems to fit tools, machinery, automotive projects, and more. The custom finishing solutions offered by metal stamping are an especially effective fit for appliance work. The resulting components perform with reliability, precision, and the appropriate polish for finished projects. Since 1981, the American Industrial Company (AIC) has worked to serve precision metal stamping needs around the world. Our team is driven by quality and dedicated to customer service. We craft the best parts for your job. To learn more about the specialty industries AIC serves, or to request a quote for your next project, contact us today. Metal stamping is used across a huge range of industries. Original equipment manufacturers (OEMs) typically utilize metal stamping to produce parts in situations in which casting would be too expensive. Metal stamping is much more cost-efficient, as sheet metal is easily recyclable. OEMs, especially those in the automotive, appliance, and aerospace industries, often drive the need for metal tooling. Some OEMs produce their own stamped metal parts onsite, while others outsource to Tier 1 suppliers. These suppliers build the dies for stamping down the line. A metal stamping operation involves a metal being cut and formed into a desired shape or profile. Three basic items are essential: the metal from which the part is to be made (typically steel, though all kinds of metals can be used, including golds and advanced super alloys), the stamping press, and the stamping die. During metal stamping, a flat metal sheet, also known as a blank, is pressed between a die and a punch to achieve the desired shape. As blanks are punched out of the sheet metal, they come through the die, which is built with a slight angle so blanks don’t get stuck inside. Punch presses are powerful machines. It takes about 71 tons of pressure to cut a 10” circle out of 0.125” sheet metal. Modern presses range from 10 tons to 50,000 tons of force. There are a number of workers involved in the metal stamping process. A machinist cuts die components to correct dimensions. A diemaker tests dies for consistency and assembles stamping tools. A maintenance technician repairs and maintains stamping dies, correcting any problems. Some parts require further work after stamping. During deep drawing, for instance, a flat blank is slowly drawn over a forming die to achieve the desired shape. Excess material is cut from the deep drawn metal. The metal might then need to be flanged. American Industrial’s metal stamping services include progressive die stamping, coining or shallow draw stamping, blanking, piercing, laser cutting, bending, and forming. Our manufacturing operations are designed for forming of a wide range of materials. Some of the most common materials we work with include stainless, cold/hot rolled and galvanized steels, aluminum, brass, copper, and high-strength low-alloy (HSLA) steel. Metal stamping is used to create a huge range of products, including many everyday items. Common household products, such as washers and dryers, are made using a sheet metal stamping process. The flatware we use for eating, the pots and pans we cook with, and the soda cans we drink from are also manufactured partially with metal stamping. Ready to learn more about the uses of benefits of metal stamping? Read more about American Industrial’s metal stamping capabilities, or contact us today to discuss your specific needs with an expert. When selecting metal formed parts, it’s critical to partner with a reliable, knowledgeable manufacturer who employs comprehensive quality assurance processes. This will help ensure you receive the highest-quality metal formed parts available, without the need for frequent maintenance or costly downtime. At American Industrial Corporation (AIC), we aim to provide industry-leading quality assurance throughout every aspect of the metal stamping process, beginning with preproduction, continuing through operations, and culminating in final inspection and shipment. As part of this commitment to quality, we maintain the most up-to-date, cutting-edge equipment. Our team regularly inspects machinery and conducts thorough product inspections to guarantee all parts are made to exact client specifications. We also take great care in sourcing and selecting our materials, and bring unparalleled precision to our metal fabrication services. AIC achieves stringent quality control through constant monitoring of production processes, allowing our workers to detect problems early and rectify them immediately, before serious issues occur. Our metal stamped parts are held to stringent, industry-specific standards, which we easily meet and exceed through the utilization of sophisticated automated inspection tools — including in-die sensors and Micru Vu inspection systems — that provide instantaneous measurements. These tools also allow records to be transmitted throughout the entire manufacturing process in order to detect variances and rectify them in real-time. The team at AIC is proud to offer a wide range of precision metal forming processes, and we are known throughout the industry for the top-quality components we produce. Serving all types of industrial applications, we provide a wide range of services: forming and bending, progressive die stamping, blanking, piercing, shallow draw, coining, laser cutting, deburring, finishing, machining, and welding and additional secondary services. All precision metal stamping services are performed with comprehensive monitoring, and thorough inspection of parts ensures optimal quality and accuracy. Finally, accountability testing and a lean manufacturing environment allow for streamlined, efficient operations — keeping turnarounds short and consistency high. In 2017, AIC earned ISO 9001:2015 certification to further ensure all our products and services meet strict customer as well as the stringent regulatory requirements established by the global standards board. ISO 9001 certification guarantees customers will receive high-quality products and services while also ensuring our company’s management and employees reap the benefits of a better-organized, safer, and cleaner workplace geared toward continuous improvement. This certification positions AIC as an industry leader in precision metal stamping and clearly illustrates our commitment to ongoing improvement and enhanced quality assurance. Our ISO certification is available to download for your records. Please contact us with any questions you may have. If you’re looking to increase your bottom line without sacrificing the quality of your product, consider metal stamping. To create new components, stamping presses transform metal blanks into desired shapes through the use of a tool and die. With a variety of modifications, metal stamping can create numerous shapes for your product, giving you greater versatility. It also offers a number of benefits including reduced product costs, shorter production time, and extended product lifespans. Getting your stamper involved from the start can save you considerable time and money later on. Often, there is a disconnect between the manufacturer’s envisioned design and what the stamping engineer can actually do within the limitations of metal stamping. If the manufacturer and metal stamper collaborate together early, however, they can eliminate such disparities and make improvements to optimize the design –– ultimately saving you production time and money. It’s important to share with your metal stamper your assembly process, projected volumes, release dates, and lead times for your product. If they have as much information as possible upfront, metal stampers can ensure a smoother production process from start to finish. For example, they may be able to redesign the stamp to reduce costs and streamline manufacturing. Since production volume directly impacts costs, be sure to let the stamper know the volume at which you plan to produce the parts. In addition, providing your expected lead time can remove the need for rush jobs and build in time for extra review, modification, and production changes — eliminating extra costs. Knowing exactly how a single part will fit into the overall design is very important when assessing your project budget. If you provide accurate dimensions for your part’s assembly, the metal stamper may be able to use in-die assemblies that can eliminate unnecessary manufacturing steps, reduce labor and production costs, and speed up the time to market. Be sure to test the design and functionality of your product before fully launching its production. Metal stampers have the ability to create prototypes and simulations that test how well the designed product will perform under certain conditions. If you find problems or issues, you’ll then be able to adjust the design to improve the product’s durability and function, as well as optimize its production. By using these simulations and prototypes, you can perfect your design before wasting any valuable time or resources in making something that won’t actually work. At American Industrial Company, we specialize in complete turnkey packages, from prototype design to completed precision metal stampings, for companies worldwide. To learn more helpful tips from our dedicated staff or to see how we can help with your next project, please submit our contact form for more information. Thanks to several innovative technological developments, the metal stamping industry has seen steady growth. Advancements in robotics, automation, and numerical controls have all helped improve stamping precision and speed, while virtually eliminating setup time. With rising global consumer demand, the industry is expected to continue riding this growth wave through 2017. Here are three major trends you can expect to see in the coming year. You’ve probably heard about the surging reshoring trend in American manufacturing; after decades of outsourcing production and contract manufacturing, many companies are now considering the financial benefits of moving their operations back to the United States. Today, reshoring actually results in a higher total cost of ownership than domestic production — despite the higher labor costs at home. Advanced automation techniques will allow the precision metal stamping industry to easily take advantage of the various business opportunities that will soon be sprouting up as more OEMs reshore their operations. Significant price drops for photovoltaic (PV) systems have made solar power much more popular. Not only can metal stamping companies benefit from the energy costs savings and federal tax credits associated with switching to solar, but they are also uniquely positioned to service this growing industry; PV installations require many kinds of precision machined parts to support the metal panel frames. Automation integration yields a two-fold benefit for manufacturing companies: higher production rates at lower costs. Utilizing advanced equipment such as laser cutters offers metal stampers unparalleled precision and speed for optimized production. Meanwhile, implementing robotics for repetitive tasks lowers the headcount in the shop while freeing up skilled machinists to take on more challenging work, such as programming. There is much more to metal stamping than most people take into consideration. Complex parts often require a series of several different steps to create. Parts that may seem simple at first glance rarely need only one stamping step to be considered properly completed. Disregarding steps such as design and prototyping, which are necessarily performed prior to stamping, there are nine primary processes involved in the actual stamping of metal parts. When required, blanking is the first step of the stamping process. Blanking is the process of cutting larger sheet or coils of metal into smaller, more manageable pieces. Blanking is usually performed when a stamped metal piece will be drawn or formed. If a part requires slots, holes, or other cutouts, piercing can be employed. Piercing, which can be performed simultaneously with blanking, punches the requisite shapes out of the metal sheet. Drawing is the actual stamping in the metal stamping process. A punch forces a section of metal through a die, providing the primary shape of the part. When the depth of the part is less than the primary opening, it is considered shallow drawing; parts with a depth greater than the opening are deep drawn. Bending is a fairly self-explanatory process. The part-in-progress is placed on a specially designed die and a ram pushes against the metal, providing the required bend. Bending is performed after drawing, as attempting to punch an already bent piece of metal causes the entire part to deform. Air bending is when the flat surface of a part is bent by a punch into a die, often V-shaped. The space between the punch and die is larger than the metal thickness, resulting in a bend that relaxes slightly when the part is released. Air bending uses less power and pressure than other bending methods. Bottoming and coining are bending processes are similar to air bending, but use anywhere from two to 30 times the pressure and the material is forced fully into a tight-fitting die, resulting in a more permanent bend. Forming is a bending process similar to bending, bottoming, and coining. It creates parts with multiple bends, such as U-bends, in one step. Pinch trimming is a method of cutting a piece from the metal sheet, separating it from the scrap metal. It is an unconventional process: the metal is pinched against a flat vertical surface. It is often, but not exclusively, used to cut deep drawn round cups from the sheet. A unique process, lancing is a type of metal cutting used to make vents or tabs. A section of a part is cut along three edges and simultaneously bent. This creates the opening or hook-like feature required but eliminates a scrap collection or secondary machining step. There are many different processes involved in the stamping process and, clearly, not every process is the best, or even required, for every part. With a full understanding of the processes, you can better design parts to minimize scrap, create cost savings, and increase production speed without ever sacrificing quality. American Industrial Company, a single source metal stamper since 1981, recently published an eBook, “Understanding Metal Stamping: Design to Prototype to Production.” To learn more about these different stamping processes, as well as the metal stamping process as a whole, download your free copy today. Types of material, plating, and cost-to-quality concerns are critical for design and fabrication. The power tool industry holds a unique set of challenges. Designers and engineers have to respond to a demanding combination of high voltages, sharp edges, high revolutions per minute, and operation by a wide range of users, with the potential for some users to be novices. The design of power tools poses as a test for an engineer’s design capabilities and a manufacturer’s expertise and precision in the fabrication. It is vital to be able to identify those metal stamping solutions that result in the most efficient combination of performance and cost-effectiveness. Here are three concerns to keep in mind when designing power tools. The first decision you will need to make is the material for your product. Steel is one of the most popular materials across industries, with a large variety of grades for multiple applications. You will need to decide whether to choose cold rolled against hot rolled steel, each with its own durability, strength, and machinability properties. Carbon steel is an alternative to steel that offers improved draw quality compared to decreased hardness, while aluminum offers better lightweight and conductivity properties. Due to the sheer range of environments and applications in which power tools are used, the ratio of strength to weight is imperative for the success of your power tool. For heavier duty applications, choose robust and durable materials like steel. For smaller power tools for wide consumer use, lightweight materials like aluminum will allow you to offer competent performance at accessible price points. One of the most common mistakes is to save on costs by cutting back on quality. This can lead to performance issues or even potential recalls that ultimately hurt your bottom line, not to mention your reputation. With the varieties of steel available, there will be options to meet all your quality concerns will not breaking the bank. American Industrial’s new eBook, Metal Stamped Component Concerns in the Power Tool Industry, has much more detail about what power tool designers need to look for in order to produce a successful final product. Inside, you will find in-depth information about how to select material, how to ensure precise thermal and electrical conductivity, and what proper plating and coating mean for you. Visit us today to download your free copy, and contact us with any questions about designing and producing your next product for the power tool industry. Know what materials to use, which finishes you need, and comply with environmental standards. Every industry has unique requirements and considerations of which companies in the space need to keep track. Designers and engineers need to be fully aware of each of these specifications when creating components for use in industry applications. For the energy industry specifically, metal stamped components or assemblies must respond to a few possible issues that can arise with applications like electric power generation, where the conductivity of metal may be the most important factor. To achieve the highest quality and cost efficiency when working with metal stamped components for energy industry applications, here are three tips to know when starting out.